EPRU and EfD will add ocean plastics pollution to the network's research agenda, focusing on consumer behaviour. When it comes to getting people to change their behaviour around mindlessly throwing away single-use plastics, rather than re-using or recycling them, what small messages are most likely to prod them to break their bad habits? Does it help to put signs up in supermarkets, urging people to re-use their shopping bags? Or is it better to push up the price of the bag with a small tax? Or would it be better to rally people around a common cause, such as a social media campaign where you ask people to name and shame big corporations whose branded bags end up littering our beaches? These are some of the ways that other countries have tried to use ‘behavioural nudges’ to influence consumers’ behaviour relating to single-use plastics, in an effort to stem the flow of plastics pollution that is threatening ocean ecosystems globally. ‘Behavioural nudging’ is a concept from economics, which uses small interventions to gently prod people to voluntarily change their behaviour in a way that has positive spin-offs in relation to specific resources, such as cutting energy or water use, or reducing household waste, or recycling more. How, for instance, can positive messages like public praises encourage people to be more water-wise during a drought? Or will the threat of steep fines for breaking water restrictions get a bigger drop in water use from a city’s residents? Resource and behavioural economists at the Environmental Policy Research Unit (EPRU) at the University of Cape Town have already run a series of field experiments where they’ve used this kind of ‘nudging’ to see if they can get water users in Cape Town to be more water-wise during the recent drought, when municipal dams ran critically low between June 2015 and 2018. Now, the EPRU team plans to apply a similar research approach, also in a South African context, where they will use nudging methods to see if they can influence people’s behaviour around single-use plastics. 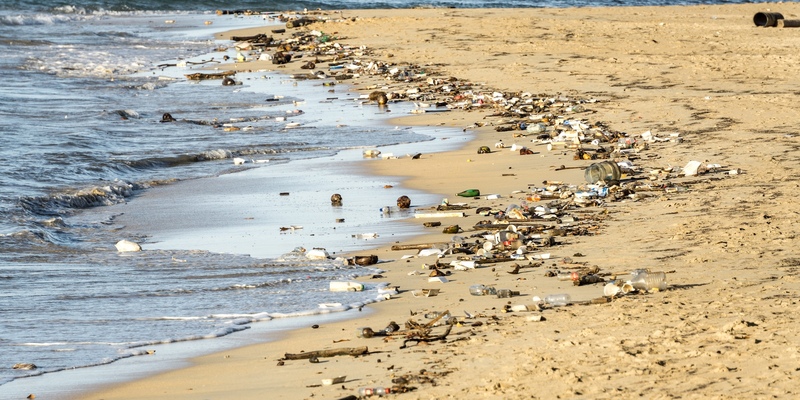 The aim is to support developing world governments in drawing up evidence-based policy that can address the growing global challenge of plastics pollution in the world’s oceans. A recent study published in the journal Science estimates that more than half of plastic found in the oceans comes from mismanaged waste in five East Asian countries. Another estimate from the Environmental Science & Technology journal, and reported on by the World Economic Forum, calculates that about 90% of the plastic that ends up polluting the world’s oceans comes from just ten rivers, all of which are in the developing world. However, these developing world countries are often receiving large volumes of plastics waste exported from the West. In South Africa, one of the largest sources of plastics pollution is from under-serviced township areas and informal settlements, according to EPRU-affiliated economist associate professor Reza Daniels. Uncollected garbage in these communities gets blown or washed into rivers or stormwater drains, and then flushed out into the ocean. In a developing world context, it is difficult for municipalities to get ‘100 percent coverage’, in terms of waste collection and recycling in these communities, according to Daniels. Here in South Africa, only 64 percent of households have their waste collected for them, according to industry body Plastics SA. Very little plastics recycling happens here: according to Plastics SA, South Africans used about 1.78 millions tons of plastic in 2015, but by 2017, only 334 727 tons of plastic was recycled. In light of this, what kinds of initiatives might get communities working together to help stem the flow of this kind of litter within their communities? How can people be gently nudged to help manage household waste in a way that is healthier for the community and the environment? What sort of nudging method is more likely to get people to recycle? Daniels will collaborate with a team of resource and behavioural economists from EPRU, which is also part of the worldwide Environment for Development (EfD) initiative, a network of developing world resource economists with a head office at the University of Gothenburg in Sweden. This year, Daniels and others will use the concept of ‘behavioural nudging’ to see how to best influence consumer behaviour relating to waste management and recycling of plastics. Daniels says the work aims to try various behavioural nudging experiments relating to plastics recycling in the second half of this year, and they will likely target schools or households in Cape Town. Last year, Daniels met with colleagues at EfD to talk about how to introduce the question of ocean plastics pollution into the EfD research agenda, and begin ‘drawing up a coherent policy’ relating to this. The EPRU behavioural nudging work will tie into this network-wide research agenda, to consider how developing world cities can better address the question of ocean plastics pollutions.